Denso Steelcoat Tank Base Protection System was recently applied on all BPGIC's tanks in their new Fujairah storage facilities terminal. The approval was based on the successful record of this Denso system used by other tank farm operators in the UAE. After hand power tool cleaning and the application of Denso Hi-Tack Primer, Densyl Mastic was used to fill all voids before the areas were wrapped with a layer of Denso Hi-Tack Tape. Denso Primer D was then applied to a masked area before a layer of Denso Ultraseal RT Tape was applied. Finally the surface was over-coated with Denso Acrylic topcoat to form a lasting waterproof and flexible seal. The external base area of steel storage tanks are susceptible to corrosion problems. 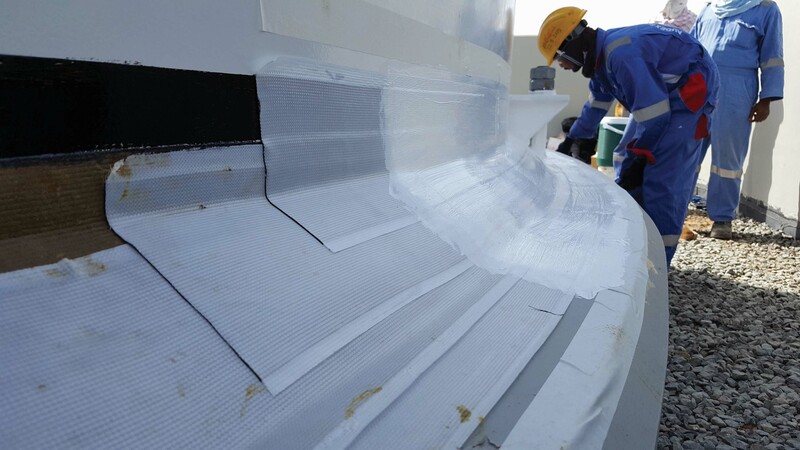 The Steelcoat Tank Base Protection System seals the vulnerable area while remaining flexible enough to move with the tank when it gets filled and emptied, while also providing a tough, highly weather-resistant outer armouring.